Timber wolf with mix of fox. He is a voice synth for utau. To replicate vocaloid to sing songs for people. With his c2-g5 vocals so he dies both . Deep Bara and, a nice Shojo opera vocals. He loves to take care of others, sing , dance , act, an be a great friend. He dislikes peppers because sensitive taste. Cruel people. An really dislikes corruption. He is a farmer raised by a human family even tho people abandoned him. His dad was a Dad, mom was a fox, human parents are native Americans. Who follow ways of old . Family is currently dead sn is a foster child. His world his currently unknown . His world was ruined by a dangerous . Plague that killed many furries. 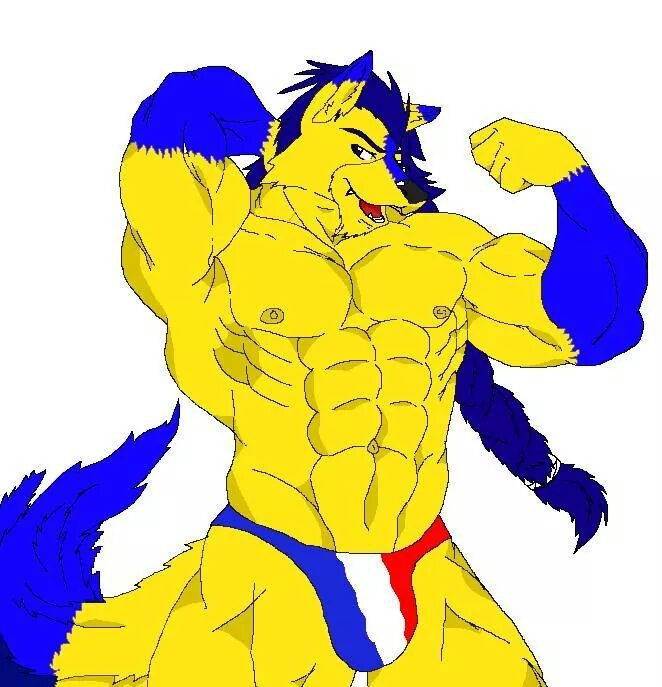 A buff yellow wolf with blue patches of furr. Long blue hair reaching down to his waste. Aqua blue eyes. His tail till near 2/3 end is yellow rest is blue. His nose to forehead has a blue fur area . He typically wears a leather brown cowboy vest open to flow . Long brown leather pants. Black boots. Black biker gloves. Occasionally a long blue scare with a brown artist's hat. He does have red white blue arm warmers. Mainly a basic wood guitar and, a bone. Please note my wolf has the sameish body as starfox wolf . Origional concept was help an done with multi friends on deviant art.